The Germany national football team is the men's football team that has represented Germany in international competition since 1908. It is governed by the German Football Association , founded in 1900. Ever since the DFB was reinaugurated in 1949 the team has represented the Federal Republic of Germany. Under Allied occupation and division, two other separate national teams were also recognised by FIFA: the Saarland team representing the Saarland and the East German team representing the German Democratic Republic . Both have been absorbed along with their records by the current national team. The official name and code 'Germany FR ' was shortened to 'Germany ' following the reunification in 1990. Germany is one of the most successful national teams in international competitions, having won a total of four World Cups , three European Championships , and one Confederations Cup . 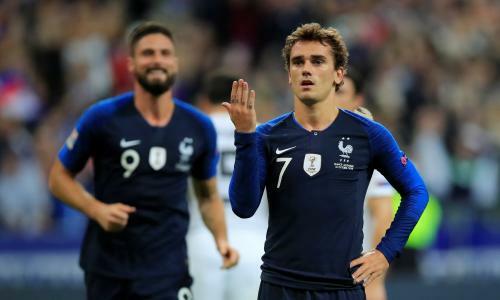 They have also been runners-up three times in the European Championships, four times in the World Cup, and a further four third-place finishes at World Cups. East Germany won Olympic Gold in 1976. Germany is the only nation to have won both the men's and women's World Cups and after the 2017 Confederations Cup it became one of the only four nations - alongside Brazil, Argentina and France - to win all three most important men's titles recognized by FIFA: the World Cup, the Confederations Cup, and the Olympic tournament. They have also won their respective continental championship .